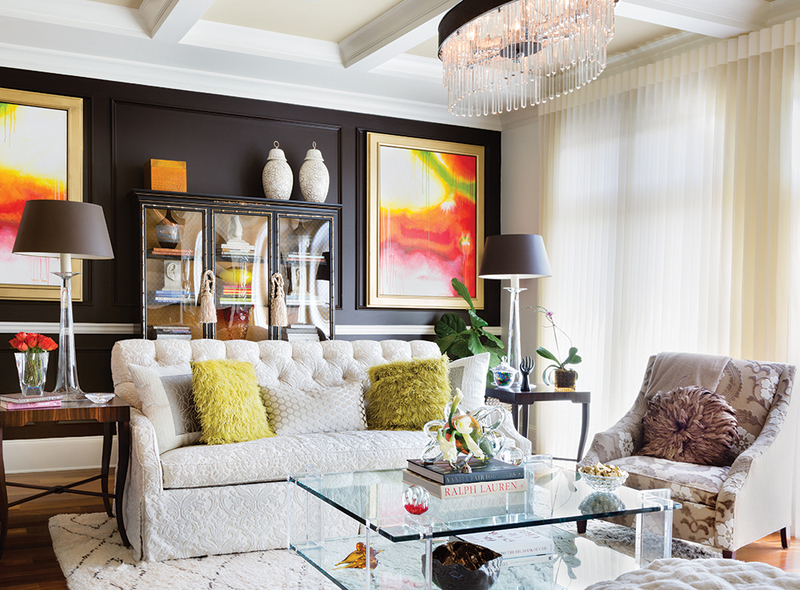 Dark chocolate walls create depth in the living room, while crystal and glass accessories keep the room from becoming too heavy. Janice Palmer grew up in Jamaica, but her decorating style transcends a strictly Caribbean vibe. “I was raised around houses with the British Colonial look, but I would describe my own style as more classic-contemporary,” the interior designer says. 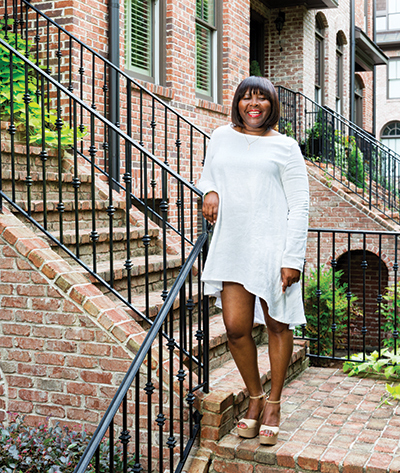 She is known for colorful rooms like her lively orange outdoor space at the recent Atlanta Symphony Decorators’ Showhouse (voted “Most Loved” by showhouse visitors). But at home, she’s more about tone-on-tone. “Brown is my favorite neutral,” she says. 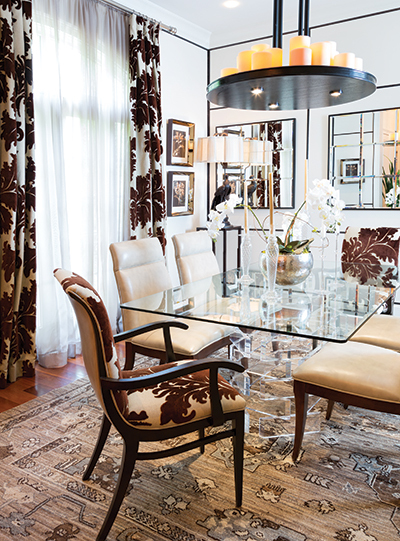 Palmer refers to her Buckhead townhome as “her lab,” where looks are always evolving. “I’m always experimenting with things at home,” she says. Case in point: the grid of thin wood strips giving her plain-Jane dining room walls some architectural definition, an idea she came up with along with her significant other, artist Carlington Brown. He’s become a willing collaborator for such finishing details. When Palmer wanted a specific type of art for the living room, Brown created abstract paintings to match. Dining room chairs were upholstered in a combination of leather and brown print (reversed on the armchairs). Accent stripes and square mirrors create right-angle geometry, so Palmer added a round light fixture for contrast. Similarly, she loves the sparkle of glass for furniture. “You can have a piece that’s huge, but if it’s glass, it sort of disappears and you can see through it,” Palmer says. To soften a room, she’s a big fan of draperies in patterns or rich colors.